Do you have a passion, mission, or story? Then you need a podcast. It wasn’t too long ago when a front porch was more than the way to your front door. The front porch was where people sat and talked, played music and talked, and then talked some more. Front Porch Studios exists to provide the space, equipment and skill to have those kinds of conversations in the digital age. At Front Porch Studios you can start the conversation with your own spoken word recordings produced as a podcast and digital media. Laugh at your stories, become a fan of your favorite show, or support a local event. If you have a passion, mission or story to share, Front Porch Studios can help you. 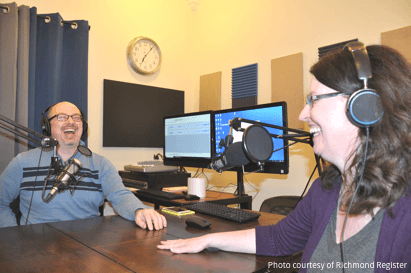 Front Porch Studios offers a fully-equipped studio environment for live podcast recording. With best-of-the-best microphones, soundproofing, and plenty of space for co-hosts or guests, you can walk in with an idea and walk out with a podcast. Work side by side with us to learn the skills to launch, edit, produce, publish, and promote your podcast all on your own. We want you to feel comfortable in this new digital world of podcasting. We offer training and consulting services to support your success. Our training services include: A general introduction to studio recording “dos” and “don’ts”; How to get rid of “uhms,” lip smacks, and flubs; and guided discussions of current best practices in recording workflow as you consider your pre-production, recording and post-production efforts. I wish I had spoken to Troy before I bought my first microphone, before I joined a network, before I had done anything with podcasting really. If you are thinking about starting a podcast or if you’ve had one for a while, he is an invaluable resource. He has given me advice that still lives in my head today. Troy was a fantastic podcast partner. He always had great ideas and was an instrumental member of our team. This was one of the best workshops I have attended. Troy and Della were great and able to present their information in a fun, interactive way. The time flew by. I wish we had a few more hours to talk podcasting! We were recently featured in The Richmond Register!